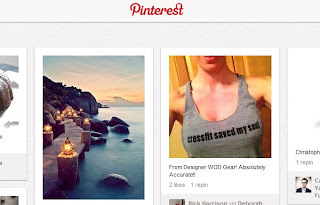 Righteous Business Blog: Is Your Local Business Righteous for Pinterest? Is Your Local Business Righteous for Pinterest? In its very essence, Pinterest is a socially-oriented image sharing site. This pinboard-style website allows for the creation and management of theme-based image collections like interests, events, and hobbies. You can browse the pinboards of others, re-pin images to your own collection, and like images that you may like. Pinterest was created by Paul Sciarra, Ben Silbermann, and Evan Sharp, and launched on March 2010. Pinterest is one of the fastest growing standalone sites ever with 19 million users in March. The average user spends an average of 89 minutes on Pinterest, higher than LinkedIn and Twitter and only second to Facebook. You will get a targeted traffic of young females who are relationship-oriented, with the site attracting 65% women with an average age of 32 years. With Pinterest, you get clearly defined interests in visual and creative categories like furniture, jewelry, clothing, and other vintage and lifestyle goods. 1. The referral power of Pinterest is equal to that of Twitter at present. 2. Shoppers who are referred from Pinterest are ten percent more likely to buy compared to those referred from other social networking websites. 3. Pins that have prices receive 36% more likes compared to those that do not. Notable brands like Coca-Cola, The Wall Street Journal, and Neiman-Marcus are all using Pinterest. It is however, important to note that not all local businesses are suitable for Pinterest. There are several tips that will help you determine if your business is on the righteous path for using Pinterest. Businesses where visuals play a vital role in products/services will benefit from Pinterest more. A business that sells art or jewelry, one that showcases beautiful lawns or remodeled kitchens or one that prepares gourmet meals will entice customers to buy the products or services on sale through Pinterest since human beings are visual creatures. You could include product reviews, customer testimonials, past works, and other content to entice customers. On the same breath, Pinterest might not be the place for you if you are offering such services as accountancy or legal services. You could use Pinterest to showcase the services or products you have on your website. You can include links to your website so that customers/clients who are interested in the images they see can find their way into your landing page. This is a good option since you will get targeted Web traffic. Only those who like what you are offering and who know about you will end up in your landing page. Once on your website, customers/clients can call in an order for local delivery/pick up, find their way to a nearby outlet, make an inquiry, or do online purchase in the case of an ecommerce site. Do you primarily cater to women? Pinterest is indeed the best place if your business primarily caters for women. As the statistics above indicate, most Pinterest users are women. This is therefore, the best place if you are involved in such businesses as women fashion and coupon code businesses. Do you have the time and resources needed to make Pinterest successful? It is advisable that you only use Pinterest if you are willing to dedicate reasonable time and resources to the campaign. You will be required to update content regularly for a high ranking in SERPs (search engine results pages) and you will be required to engage with other users on a daily basis (or on near-daily basis). For success in your Pinterest campaign, you will be required to complement the Pinterest campaign with other social media and other Internet marketing campaigns such as affiliate marketing and email marketing. Are you targeting an international audience? Using Pinterest is a good idea if you are targeting more than the customers/clients in your locality. Thanks to the Internet, local businesses are now able to compete with larger businesses from around the world. Pinterest does not really help you if you are only targeting the people in your building since they will already know about you and what you are selling. You could enlist the services of a professional to advise you if your business is suitable for Pinterest. You could even have a professional manage your Pinterest campaign for convenience and professionalism. This way, you will be able to concentrate on running your business. Is Pinterest set up to maximize my presence? The process of setting up Pinterest is straightforward and it does not take too long, but proper steps must be followed if the profile is to have the desired effect. There should be descriptive keywords in the ‘about’ section. This section should give details on the business, including its location. Add website URL to the Pinterest profile and link the account to Twitter and Facebook for greater Web traffic. Add a Pinterest ‘follow’ button on your site and a ‘PinIt’ button on each one of your products/services. This will allow for following and sharing respectively. Have different boards for your different products/services with names that are easy to identify. The boards should highlight the products/services you have on offer. It is also advisable that you create boards promoting discounts. Pin an image in each one of the boards and use descriptive language in the boards, including the prices of the products/services where applicable. One the most common mistakes of using Pinterest is pinning images to your boards exclusively for promotional purposes. Mix up whatever you are selling with something interesting, even if you are not selling it. You could also use your boards to give tips and advice, such as how to wear a belt if you are selling belts. Are you able to engage the Pinterest community? A Pinterest campaign will only be successful if the community is involved. To do this, follow like-minded individuals and businesses in your local community, comment, re-pin and like content that your followers seem to care about and host regular contests. Do you have another social media presence? Complement your Pinterest campaign with other social media campaigns for maximum benefits. Remain active and integrate activities in all social medial platforms whenever you can. Take time to review the content that followers seem to enjoy more. All in all, Pinterest can be a powerful tool for ecommerce marketing for local small business.